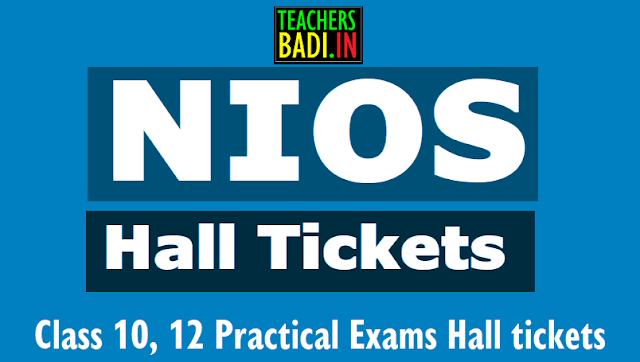 NIOS class 10, 12 practical exams hall tickets at nios.ac.in, NIOS Hall tickets: NIOS Class 10 practical exams hall tickets 2018, Class 12 practical exams Hall tickets 2018, NIOS Class 10, Class 12 practical exams hall tickets. NIOS hall tickets 2018: The National Institute of Open Schooling (NIOS) has released the hall tickets for class 10, 12 practical examination on the official website – nios.ac.in. The practical examinations will be held from March 15 to 29 (for Indian students) and from April 17 (for overseas students). All those students who have registered for the same are required to download their respective tickets from the website itself. Along with the admit cards, the datesheets for secondary and senior secondary April examinations, for both Indian and overseas candidates, have also been published. The exams will be conducted from April 4 to 26. NIOS: The National Institute of Open Schooling (NIOS) formerly known as National Open School (NOS) was established in November 1989 as an autonomous organisation in pursuance of National Policy on Education 1986 by the Ministry of Human Resource Development (MHRD), Government of India. NIOS provides a number of Vocational, Life Enrichment and community oriented courses besides General and Academic Courses at Secondary and Senior Secondary level. Note: The server of the link is down, candidates are advised to regularly check the website for the admit card and other notifications.